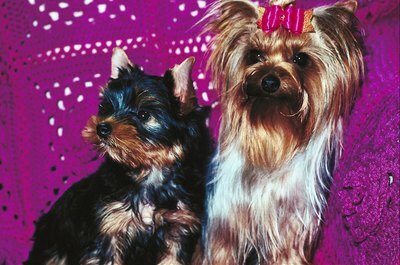 With their versatile and soft fur, Yorkies sport long, short and accessorized hairstyles. A Yorkshire terrier's luxurious coat is perfect for versatile hairstyles. Your dog's hair requires regular brushing to keep it healthy and manageable for styling. Experiment with hairstyles to determine the most suitable one for your dog. Some Yorkies get agitated wearing barrettes and bows, instead provide them with sleek, long styles and smart cuts. A short cut is cute and practical for a high-energy Yorkie. Have her coat and facial hair groomed in short layers. For a cuter look ask your groomer to trim your dog's hair in a square puppy cut. A "square" style is anything but nerdy, especially when you keep her ear hair longer than the hair around her head and mouth. For a punk edge, keep a small section of her front locks longer than the rest and slick them to the side with doggy hair gel. Whether your dog boasts long or short hair, a bow or sparkly barrette atop her head may be her perfect accessory. Just like Yorkies, hair accents come in different shapes and sizes. Vendors sell double- and single-loop bows to accommodate different sized Yorkies. For an eye-catching look, consider placing bows along other areas of her coat. Your little princess can even sport a regal topknot, which is simply an arched ponytail secured by a hair clip. If you don’t mind the upkeep, let her hair hang down. Traditionally, a Yorkshire terrier's coat is long and parted down the middle. Trim her hair floor-length so your girl can still move freely but look cute in the process. She will need daily brushing with her sleek long hairdo, but it's an ideal way to spotlight the sheen and highlights of her coat, which are classic attributes for the breed. Show off her pretty face with a small or long ponytail. A pony at the top of her head or one set-off to the side is cute and stylish. Use a small ponytail holder or soft hair band to secure her delicate hair. Consider braiding your Yorkie’s ponytail. Feel free to spike the little hairs above the ponytail with a small comb to style a funky hairdo. If she’s a show dog, or even a wanna-be diva, her coat will be long and trimmed to floor length. A new twist on that look is to get her body hair cropped short leaving her legs, underbelly and ears shaggy. Kick up the cute factor by accessorizing her with a studded collar or a bandanna that matches her coloring. Lastly, a totally spiked hairstyle makes for an impishly adorable male Yorkie.